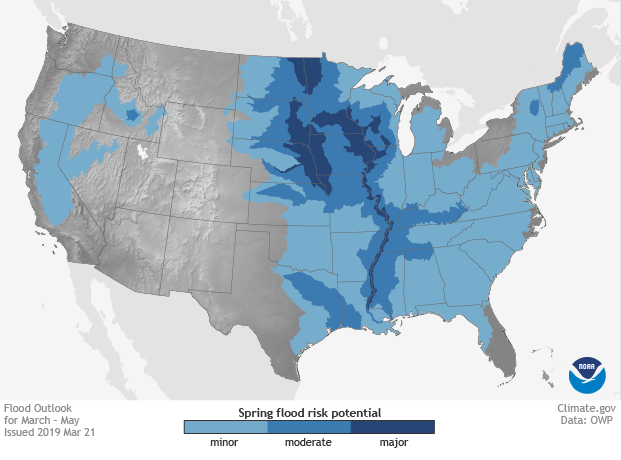 Following a wet winter, many parts of the United States are at risk of at least minor flooding this spring. In this video, the Climate Prediction Center's Mike Halpert explains what's behind NOAA's temperature, precipitation, and flood outlooks for spring 2019. 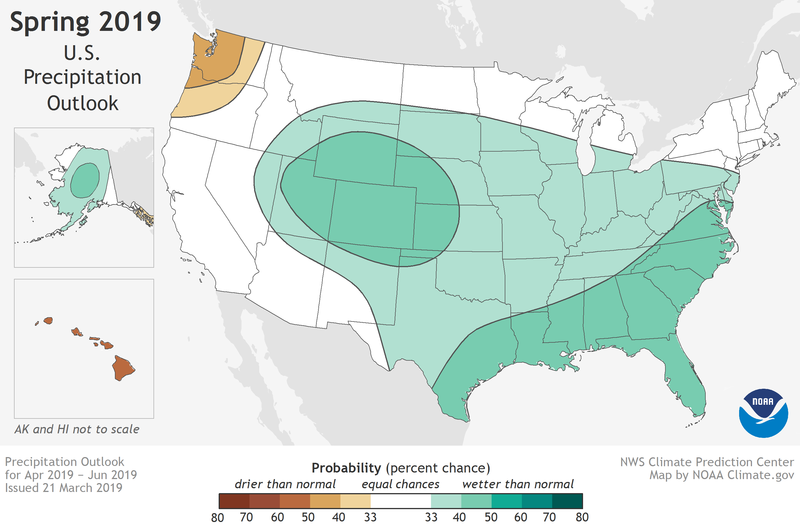 Shades of green and brown show the chances of an unusually wet or dry spring (April-May) in 2019. "Unusually wet or dry" means seasonal average precipitation in the top or bottom third of the climatological record (1981-2010). Darker colors mean higher chances (greater confidence in the forecast), not how wet or dry the conditions will be. NOAA Climate.gov map, based on data from the Climate Prediction Center. Below-average temperatures are most likely in the Central and Southern Plains, where the saturated ground will slow down the seasonal warm up. Odds for a much warmer than average spring are elevated above background probability levels in Alaska (where lack of sea ice in surrounding waters allows more rapid seasonal warming), in areas east of the Mississippi, and in the West and Pacific Northwest. Shades of blue and red show the chances of an unusually wet or dry spring (April-May) in 2019. "Unusually wet or dry" means seasonal average temperature in the top or bottom third of the climatological record (1981-2010). Darker colors mean higher chances (greater confidence in the forecast), not how warm or cool the conditions will be. NOAA Climate.gov map, based on data from the Climate Prediction Center. 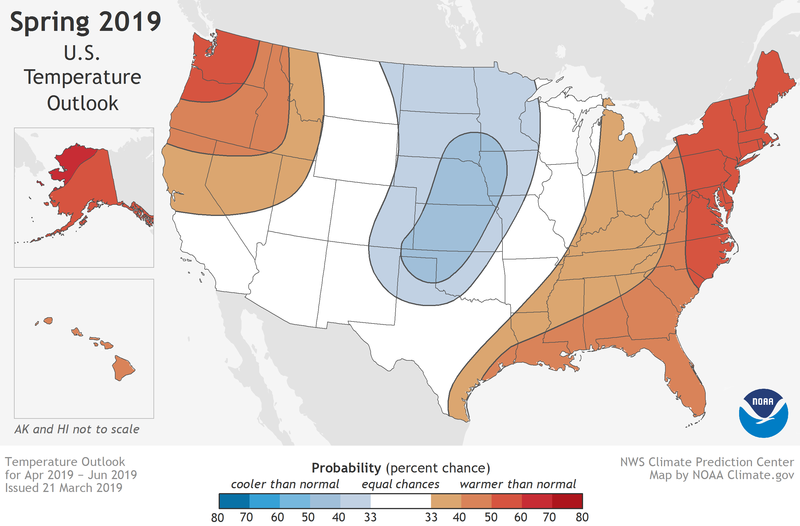 For a more detailed discussion of the factors influencing this spring's seasonal outlook, visit the Climate Prediction Center's website. For experimental forecasts of departures from average stream flows, explore the interactive map on the Office of Water Prediction Website.